docMgt has a sophisticated workflow system complete with follow-up actions that are used for actions such as escalations, reminders and more. This article explains how to use follow-up actions to get the most out of your workflow experience. Follow-Up Actions are actions that performed on active Work Items based on rules and schedules. Work Items that are active may need to be moved automatically or users reminded of them via an email. Follow-Up Actions give you the ability to monitor work items and make sure work is being performed on schedule. Follow-Up Actions include the ability to update Record or Document variables, send emails, cancel work items, complete work items, reject work items, re-assign them, add Record or Document notes, assign or return assets, perform searches and update values and make REST calls. Why Would I use Follow Up Actions? There are several scenarios where Follow-Up Actions can help. Most commonly they are used to make sure due dates are not being missed. For instance, you can add a Send Email action to email someone when the work item is 1 day before its due date. You can then have another action that re-assigns the work item on the day it will be overdue. In this way you can help ensure items get processed and are not missed. How Can I Configure Follow-Ups? Follow-Up Actions are available at each Work Trigger. 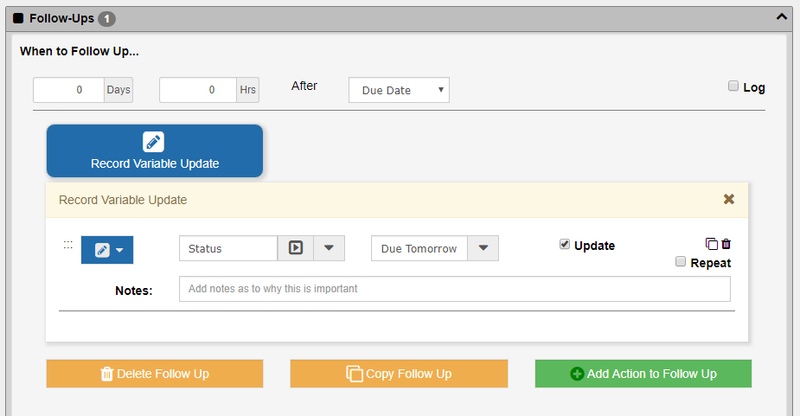 Open up the Work Trigger in the admin interface and scroll to the bottom to the section titles Follow-Up Actions. Here you can add, edit, copy and delete follow ups. Most of the action types are the same as outlined in the article Workflow Part 3 – Action Types. The difference is that instead of being triggered by a user clicking a button, these are triggered automatically by the system based on rules. In the “When To Follow Up…” section you can specify when to trigger the follow up action. You would normally specify a number of days or hours after an event such as Due Date or Assigned Date or a Field Date (invoice date, etc). If you need to trigger based on a number or hours or days BEFORE a date you can use a negative number. For example, to trigger a follow up 3 days before the Due Date you would specify -3 days and select Due Date. Add any number of actions to perform for that one follow up event or add many events base don other triggers. There is no limit to the number of follow up events you can specify per trigger. The most important advanced topic in Follow-Up Actions is the ability to repeat the action. If you want to send an email 1 day before due date you can then have that email sent out every hour thereafter until the item is moved. You do this by checking ON the Repeat option then selecting the proper repeat schedule settings. These can be based on Hourly, Daily, Weekly, Monthly or Yearly repeat schedules. Follow-Up Actions are an essential part of any workflow-driven process. Use them to stay on top of the process and not let things fall through the cracks. If used correctly, you should never lose another work item.